The Emu-Z-Um is a family friendly historical museum about the early settlement of Owyhee county and southern Idaho. The museum collections include artifacts from the late 1800's and early 20th century, that were used by Owyhee county pioneers and other early Idaho settlers. There are diverse collections of everyday items including period clothing, antique kitchen gadgets, early vehicles, frontier farming and ranching implements, mining equipment, Native American artifacts and much more. The collections will give you a wonderful glimpse into how Idaho's early settlers and miners lived, worked, and played. Located in Southwest rural Idaho, near Grand View, a 60 mile drive Southeast of Boise. The museum is located on the South side of the Snake River along the South Alternate branch of the Oregon Trail. From your visit with us, hopefully you will come away with a much better understanding of what life was like in late 19th and early 20th century Idaho. Jack and Belva Lawson would like to welcome you to their Emu-Z-Um – a whimsical name inspired by the 100-plus emus they once raised at their ranch. 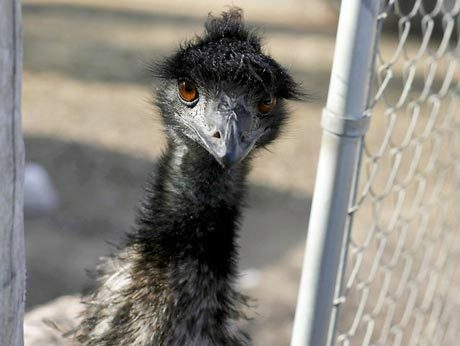 If you have never seen an emu, there are still a couple of them left. These large, not very sociable, birds are native to Australia. A link to more information about them is located under the picture below. A visit to the Emu-Z-Um is an experience the whole-family will enjoy. Jack and Belva, and maybe even the emus is looking forward to seeing you! Although unlike Jack and Belva, most likely the emus could care less. Remember when life was a little slower, living a little simpler, and Coke was just a nickel? At the Emu-Z-Um you can turn back the clock to that by-gone era. Travel back to see an authentic replica of an early 1860’s town with wooden sidewalks, and picture-perfect storefronts. You can even visit the town jail. 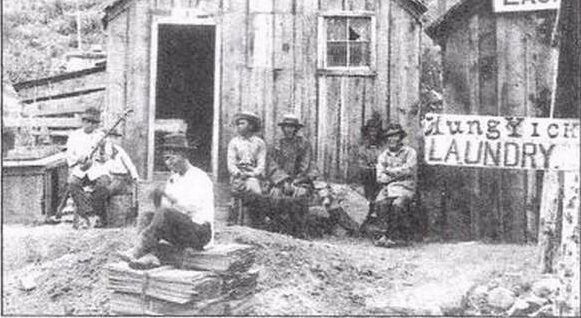 The article is available here on The Statesman's website page entitled: "Early Owyhee County, like 19th century America, was a melting pot of nationalities". Live the experience of Silver City, Idaho’s boom town of the 19th century, including all the exhibits that were once in "The Silver City Schoolhouse Museum" in Silver City. See Silver City’s first hand-built automobile. And find out how it came to be. As was mentioned in Art's above article, see how the Chinese impacted Silver City. 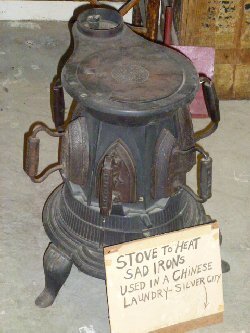 Special ironing-stove from Silver City used to heat sad irons in a Chinese Laundry. Copyright © 2009-2019 Lawson's Emu-Z-Um. All Rights Reserved.